Today. Grant Dalton, skipper of the Nautor Challenge men's crew, announced he will race the V.O.60 designed by Nautor's Swan Frers design house. Nautor Challenge, Nautor's Swan round the world racing team, has built two new yachts in a bid to claim the most prestigious of ocean racing trophies, the Volvo Ocean Race, previously Whitbread Round the World Race. One from the drawing board of Milan-based Frers design office and the other from Annapolis-based Farr Yacht Design. Stringent tests have been carried out on both yachts over recent weeks to determine which yacht will be raced by the men's team, skippered by Grant Dalton and which yacht will be entered by the women's team, skippered by Lisa McDonald. He continued; 'Then we ran our performance data against data on the weather likely to be encountered from September 23. This is where accurate data comes into contact with knowledge of historic weather, intuition, gut feeling and to an extent, crystal ball gazing. Frers design team has been the design house for Nautor's Swan for many years, upholding the unique reputation Swans have as being the most luxurious and beautiful yachts in the world. V.O. 60 capable of circumnavigating the globe in this premier ocean race. The brainchild of Leonardo Ferragamo, Chairman of the Nautor Group, the Nautor Challenge division is designed to enter teams into grand prix events in the same manner that Ferrari has a Formula One team. In addition to the waters off Pietsaari, Nautor's Swan will now be benefiting from products tested in the Doldrums and the Southern Ocean. 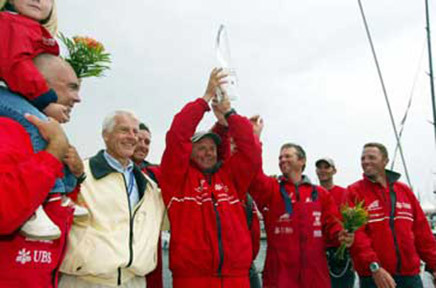 This website was created in 2001 to promote the Round the World Racing Team of Nautor Swan, and the Nautor Challenge. 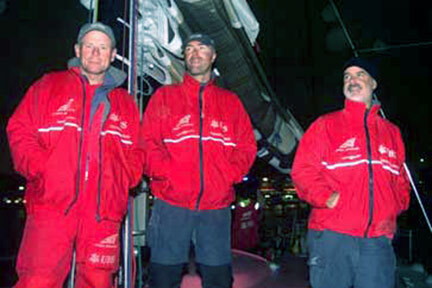 News releases, articles, photos, and even movies were available on this site following the crews and boats through the 2001-2002 Volvo Ocean Race. Visitors to the site could vicariously experience all the excitement, and thrills. I was an avid follower of this site. Watching the videos of the races was great for those of us who had to be "arm chair" followers. My wife always knew when I was planning to watch the races because I would be wearing one of my lucky Batman T shirt designs. Wearing a Batman T-shirt has become a habit whenever I made a bet on a sporting event whether it was football, tennis, basketball, the Olympics, or in this case yacht racing. A silly affectation one might think, but I always felt Batman gave me good luck. And 9 times out of 10 it was true. I hope this site brings back good memories to you, enjoy. Grant Dalton, skipper of Amer Sports One after coming third overall in the Volvo Ocean Race. 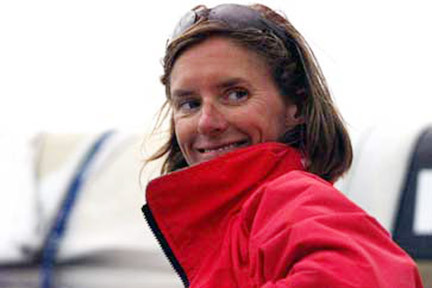 Lisa McDonald, skipper of Amer Sports Too, after coming fourth in the leg nine of the Volvo Ocean Race. 2002-06-07v Is it the last round the world race with the vo 60? Eventually NautorChallenge.com's domain registration expired and this site disappeared from the web. When I recently I discovered that the domain for the NautorChallenge.com was available I bought it with the goal of recreating some of its content from archived pages. I definitely didn't want someone else purchasing the domain and re-purposing the site for something that had nothing in common with Nautor. The information posted on is still great reading and brings back lots of memories to those who follow this type of ocean yacht racing. You can view this site strictly for historical reasons or use the information presented in a useful manner. 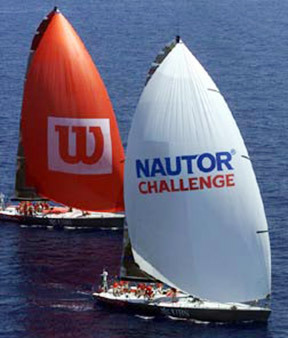 Nautor Challenge is the Round the World Racing Team of Nautor Swan, builder of the renowned cruiser-racing yachts. Oy Nautor Ab, based in Finland. but under new Italian ownership, is rejoining the racing arena with two new v.o.60s specifically designed and built for the tough, tactical round-the-world battle that is the Volvo Ocean Race 2001-2002. Nautor Challenge is a new established project of Nautor Swan and the participation in this year's Volvo Ocean Race is the first of its racing projects. And together with Amer and UBS this two boat campaign will compete with one male crew with Grant Dalton as skipper and one all female crew, lead by Lisa McDonald. The board of Nautor Challenge S.r.l. : Riccardo Bonadeo (Chairman), Fred Andersson (Chairman Team EF in Whitbread 1997/98), Enrico Chieffi (board member of The Nautor Group), and Grant Dalton head of sportive and technical organization. Q: How does it feel, another podium finish overall. You must be pleased. A: Yes. That was a bit of a stressful leg. Third's not first. We've reflected on it over the last few miles when we realised we were going to be in third place. This time a year ago, we didn't even have a boat. With all the trials and tribulations, I think it is just fine. Q: Both your boats in together, and not necessarily in the order you would want! A: Well, I think it was quite decent of us to let the girls ahead of us. It sort of adds to the story I think it was a pretty good thing.. (laughs!) Seriously, they sailed a really goodleg. We had a plan before the start this time and it was the right way to go, and now it's all over. Q: This campaign has been so much hard work, you must be delighted with the result? A: Yes, I am really. You remember in Southampton nine months ago, I said I would be happy with third, when on paper we were probably only about seventh. Some very good campaigns finished behind us, but two excellent campaigns in front of us. I am happy, yes. To Assa Abloy and particularly Illbruck was always a winner, they never looked in trouble this leg at all and they've done a great job. Q: How have the crew helped to make this such a successful campaign? Grant Dalton honours his vow. A: It's not insignificant that this is one of the few campaigns with no crew changes except one, which was through illness. The guys have stuck together. We've had bad legs and have been beaten consistently by Tyco and News Corp and we've just had to stick together. There‚s always the pressure to change things, people or the boat, but I've always felt it wasn't broken, so there was no need to try to fix it. There were event calls for us to take less people on this leg and I didn’t really want to do that and I am glad that they've all come through and this is as good as we could have done. Q: Are you glad that you took this boat rather than the other one? A: I go through that every time we have a bad result too and I think that, if you look at it now, what could have been, illbruck was always going to win. At best we could have beaten Assa Abloy, but I don‚t think we ever would have, in the other boat. Probably we‚ve done about as good as we could ever had done and so on that basis, I am happy with that selection of the boat. Q: Fourth place, how does it feel? A: Absolutely fantastic, we are really, really happy. A: We went out on start day wanting to get a clean start, and not get involved in anyone else’s scuffles, we wanted to get out of there in one piece. The wind was pretty tricky, we had to rely on our crew work, which I think we have got down pretty well. We also knew we couldn’t afford to make any big mistakes because any little mistakes we made we could see a huge sudden loss next to the other guys immediately, so we just had that philosophy throughout the night. It got really shifty last night, and I’m sure you guys were watching and saw that the boats were pointing in all directions, going every which way, and a lot of it was just keeping our eyes open to see where the wind was going to come from, and keep on the right side of it. Q: The conditions really should have suited Amer Sports One shouldn’t they? A: We thought, from our experience, it was an area where we had a slight edge provided we did everything right and sailed the perfect race. The guys who were in front of us sailed the perfect race. This afternoon it could have been anyone‚s race, from second to fifth certainly where we were. We were all under big clouds pointing at each other or away from each other. Then I had a bit of a sandwich between my husband and my boss for the rest of the day! We were in good company! Q: What is next on the agenda? A: I think one of our sponsors, UBS, are throwing a huge party tonight! That’s as far as my focus goes at the moment! Q: Does the result have any healing properties after some disappointing mishaps? A: I think it was a nice way to finish for the team because we always knew we had it in us, and we’ve battled with drama on the high seas, as well late preparation and all of the things that went along with that. We’ve worked really hard on our crew work and our communications, and manoeuvring of the boat and our working with the sail programme, and I think that has started to pay off for us. It’s just a pity we haven’t got a few more legs. Q: Are you particularly happy beating Grant and the boys? A: Oh yes! It’s fantastic, I’ve been teasing him all year about that. A: What a leg. You were out in front for so long! Q: Yes, I think we sailed really well. The guys did a really great job. We had a great start and we led for the first 24 hours. But once we started reaching when we got into the North Sea in moderate air running, we just didn't have the pace. In fact we got right back into third, two hours out of here, and then we started reaching again and then we got rolled again. The guys did a really great job; the boat just didn't have the pace. Q: After all that, how does it feel to be fifth! A: We were fifth in the last leg too and I wasn't‚ that happy about that although there was nothing we could have done about that. We're just not fast enough full stop, in that stuff. We get right back in it, you can see from the way we start. We were going through some of that today. With the exception of one start in Sydney, we've won every start and led, and then we are rolled. It's just the way it is. We really are, at the end of the day, starting to see the preparation time that we didn't have, starting to kick in here. Q: You're now in joint third place overall! A: Yes, it's going to make it pretty interesting on the last leg. I've been in this position before. In the last race we were third and we won the last leg, so it doesn't change anything and I had a feeling that this was probably going to happen and that it would come down to the wire for us. Now illbruck will be worrying about Assa Abloy, they‚re in another race now. Q: You‚re not going to get second place, how does that feel? A: I would be still comfortable with top three. I think the way we sailed this leg, I feel very comfortable about the way the boat‚s being sailed. I think the whole boat sailed really well. We just don't have the wheels when reaching. Just out of here we were ahead of illbruck and we had five miles to go to the entrance. In a normal race, you‚d have them covered and that would be it, and they just rolled clean over the top of us. That is the way it is. Q: What about the next leg then? How are you going to beat Tyco and News Corp? A: It‚s a short leg, and if you look at the history of the last legs, it always takes them a while to break back from the good start. So, we just keep doing that and hopefully the 24 hours, which it should take, will not be long enough for them to catch us up. In the archipelago and when we get down into Germany, and out of here as well, where it gets tricky like that, we always sail well. It was like that this morning, from just getting blasted in the North Sea, we caught up again by just rock hopping and Roger Nilson took us into a couple of spots that you just didn‚t want to be, but there was less current in there and we just caught up. We‚re fast upwind in a breeze. That's the way it was out of the start and coming up round the coast of Norway. We‚re really quick in a breeze and that allowed us to get back into the race. So, if the conditions are right and we can do a lot of hiding behind rocks and dodging currents and things like that, then we‚ll be fine. Q: What was the leg like? A: Well, most of us had the Œflu, I have a really bad cold. It wasn‚t that bad. It was fast; we‚ve only been at sea for four days, we didn‚t have a lot of sleep, but you wouldn‚t expect to on a four-day leg. Q: Everything still to play for! A: In theory, that is what I expected. I‚ve been in this position a number of times before and it doesn‚t make me feel any different from any other leg. Amer Sports ONE skipper Grant Dalton talks to Stuart Alexander of the Independent, London. The chips are down for a grandstand finish into Kiel now that we have three boats on equal points in third place after one hell of a leg up to Sweden from France. Only one of us can be on the podium when it is all over, and we still want to be that one boat. While John Kostecki and illbruck can still be beaten for first place, the only boat that can do that, Assa Abloy, with Neal McDonald in charge and on a charge, is secure in second place. Kostecki has made it quite clear that his only task is to make sure he is not beaten by McDonald and it looks as if he would take any defensive action, including match racing McDonald out of any chance of beating him by the required six places, to make sure of winning the overall trophy. We don't want to be caught up in that, but, at least if McDonald does not make a flying start, it could help all of us, Amer Sports One, Kevin Shoebridge in Tyco and Jez Fanstone in News Corp, to concentrate on our own private battle. The outcome is likely to depend on the weather conditions more than anything else. If it is light or in any way downwind then Tyco will be in the driving seat. If there are reaching conditions I expect News Corp to be strong. We want to see a good, stiff beat upwind. I think we are fast in those conditions. We were also fast coming out of La Rochelle this time, where we were able to blast away up the French coast and blast away again when we went round Ushant. But we were then rolled by the others and went from first to fifth. Even when we got past illbruck again - they lost a chunk of places just through one bad change to a code zero sail - they were able to reel us in again and just sail past. And that was on a leg which I think we sailed nearly perfectly. I don't usually say that but the crew work was just great. Everyone thought we would have clashes with four such strong characters at the back of the boat, myself, Bouwe Bekking, Roger Nilson and Dee Smith. But we are a great team. And, looking at the rest of the crews when I came ashore, by comparison my guys looked wiped. They had sailed really hard, but you need everything and more when the top five boats are separated by only seven minutes after 1,150 miles of the most incredible racing. And what a great job by our all-woman crew on Amer Too. With a little help from our sponsors and some very nifty footwork by our shipping agents Peters & May they recovered from their dismasting on the last leg to make to the start line on this one, though I think they were more tired than they would like to have been. We are all expecting Volvo to use its home town stopover to announce next Wednesday that it will definitely be backing another race in 2005/2006, but they may take more time, perhaps until Christmas, to flesh out the detail about things like the course, the number of stopovers, and the type of boat they will use. For sure the most important thing to tackle is cost, but I had said that this would probably be my last Volvo, though not necessarily my last round the world race. But I still want to win this race. I thought I could let it go, but now I am not so sure.